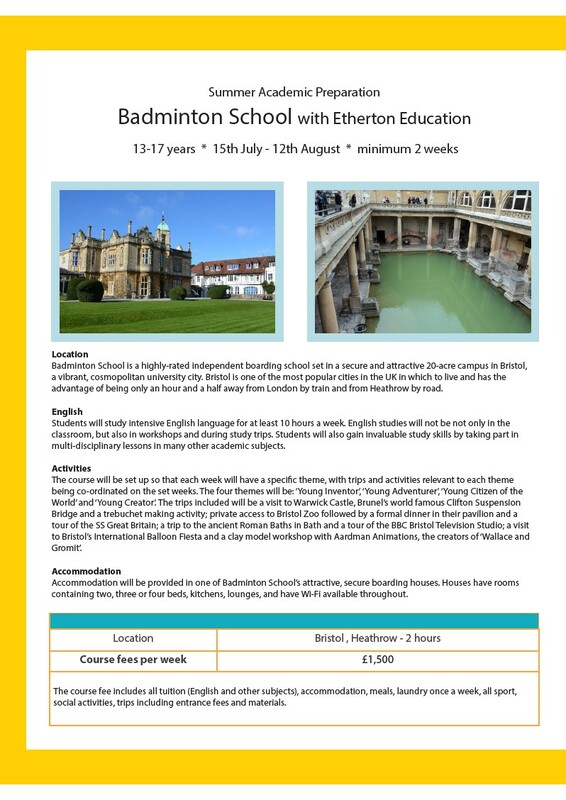 16 Summer Academic Preparation Badminton School with Etherton Education 13-17 years * 15th July - 12th August * minimum 2 weeks Location Badminton School is a highly-rated independent boarding school set in a secure and attractive 20-acre campus in Bristol, a vibrant, cosmopolitan university city. Bristol is one of the most popular cities in the UK in which to live and has the advantage of being only an hour and a half away from London by train and from Heathrow by road. English Students will study intensive English language for at least 10 hours a week. English studies will not be not only in the classroom, but also in workshops and during study trips. Students will also gain invaluable study skills by taking part in multi-disciplinary lessons in many other academic subjects. Activities The course will be set up so that each week will have a specific theme, with trips and activities relevant to each theme being co-ordinated on the set weeks. The four themes will be: ‘Young Inventor’, ‘Young Adventurer’, ‘Young Citizen of the World’ and ‘Young Creator’. The trips included will be a visit to Warwick Castle, Brunel’s world famous Clifton Suspension Bridge and a trebuchet making activity; private access to Bristol Zoo followed by a formal dinner in their pavilion and a tour of the SS Great Britain; a trip to the ancient Roman Baths in Bath and a tour of the BBC Bristol Television Studio; a visit to Bristol’s International Balloon Fiesta and a clay model workshop with Aardman Animations, the creators of ‘Wallace and Gromit’. Accommodation Accommodation will be provided in one of Badminton School’s attractive, secure boarding houses. Houses have rooms containing two, three or four beds, kitchens, lounges, and have Wi-Fi available throughout. Location Bristol , Heathrow - 2 hours Course fees per week £1,500 The course fee includes all tuition (English and other subjects), accommodation, meals, laundry once a week, all sport, social activities, trips including entrance fees and materials.